If you clicked on this page I’m sure you are expecting to find something out about the author of this blog. Well my name is Craig and not long turned 41 years old. I have been majorly into movies and video games for a long time and feel I know a good amount about both. That’s not saying I’m an expert, but I do often seem to know a lot of answers to movie quizzes and celeb gossip! My favourite genres in movies tend to be horror and thrillers. I had a rather obsessive interest in Hong Kong Action Movies during the nineties, and what I don’t know about Jackie Chan and John Woo really isn’t worth mentioning (maybe). I also put my hand to fiction writing and have written several book length stories. But as I’m a bit of an egomaniac when it comes to my writing, I rarely show anyone my stuff for fear of them picking it to pieces with me left feeling I’m not really any good at it. To those that know me in ‘real-life’ I am a kind, supportive friend, a caring and I hope funny & likeable soul. I am a deep thinker, and I show my emotions easily, and can probably take things to heart, but I am me, and that’s who I am, like it or not. 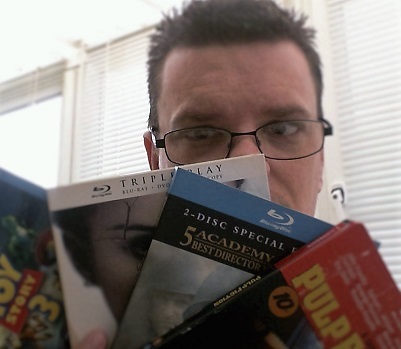 Oh and yes, that picture above is me, hiding behind a few Blu-rays. Pulp Fiction, Fight Club, Annie Hall, Terminator series, Leon and Monsters Inc. I also have a love of Japanese Animation, especially from Hayao Myazaki (Spirited Away, Ponyo). Jake Gyllanhaal, Edward Norton, Robert Downey Jr, Ellen Page, Leonardo DiCaprio, Scarlett Johansson, Emma Stone, Amy Adams and Marion Cotillard. Half-Life 2, Portal 2, Tomb Raider series, Bioshock series, Alan Wake, Enslaved, Mass Effect 2 and Vanquish. My aim when starting this blog, back in April 2007 was to review every movie I watch, so I can firstly have an archive of my movie opinions, then secondly, share them with the world. I hope someone out there gets something out of reading my reviews, and perhaps discovers a movie they wasn’t previously aware of, or chooses to watch something based on what I had written about it. That would give me great satisfaction, and I would feel that beyond doing these reviews as a hobby, they had made a difference to someone’s viewing habits. That being said, if you find you disagree with my opinions here, feel free to have your say. I do not profess to being an authority on movies, music or games and what I like someone else may not, and so on. If you need to contact me, add a comment or just say hi … and are not on WordPress, fill in the form below. Are you open to contributions from outside writers? Sounds good man. I will also check out your site. Thanks for visiting. Craig, would you be interested to star in one of my weekly “Moviesite Spotlight” posts? The questions are the same each week, so you could just grab one of them and send your own answers to myfilmviews@gmail.com. Sounds good. I will email u. Hey, Craig, thanks for mentioning my post in yours. I really appreciate it. Happy to spread the word,man! I added you to my recommended blogs page. I hope you don’t mind. We don’t have a ton of traffic yet but we are motivated and in it for the long haul. Stop by if you have a chance! Sounds good … go ahead. Thanks for your comments! What did you think of this year’s Oscars? Will you post about it? Hey thanks. I’m just checking yours out now. Looks good. Thanks for giving mine a look.